A Great Day of Boating is a Complete Success When Your Engine Starts to Take You Home! There is no worse end to a boating trip than discovering a discharged battery when you are ready to call it a day. With the new StartNow from Charles Marine, you never have to worry about facing this unpleasant experience. 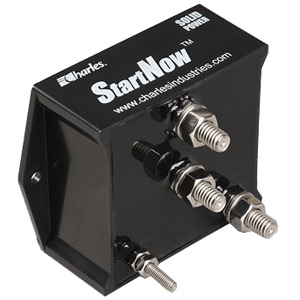 The StartNow microprocessor allows the main battery to drain without draining the reserve battery. StartNow automatically detects if the main battery voltage is too low and activates the reserve battery to start your engine. Recharging is automatic from an alternator or battery charger and the microprocessor guarantees the battery will never overcharge and always be ready. A Great Day of Boating is a Complete Success When Your Engine Starts to Take You Home! There is no worse end to a boating trip than discovering a discharged battery when you are ready to call it a day. With the new StartNow from Charles Marine, you never have to worry about facing this unpleasant experience. The StartNow microprocessor allows the main battery to drain without draining the reserve battery. StartNow automatically detects if the main battery voltage is too low and activates the reserve battery to start your engine. Recharging is automatic from an alternator or battery charger and the microprocessor guarantees the battery will never overcharge and always be ready.